Summary and Definition: The Pennacook tribe were members of the Wabenaki Confederacy. They were fishers and hunter-gatherers who inhabited New Hampshire and parts of Maine, Massachusetts and Vermont. Their numbers diminished due to the diseases brought by the French and English colonists and by wars. By the end of Queen Anne's War (1702-1713), the Pennacook had largely been absorbed into the Abenaki. What language did the Pennacook tribe speak? The Pennacook tribe spoke in the Algonquian language family and were members of the Wabenaki Confederacy. The name Pennacook comes from the Abenaki word 'penakuk' meaning "at the bottom of the hill." The people are also referred to as the Merrimack and the Pawtucket. What was the lifestyle and culture of the Pennacook tribe? The Pennacook tribe were primarily fishers, farmers and hunter gatherers. The Pennacook mainly lived in wigwams made of birchbark but as inter-tribal warfare increased they also lived in fortified villages of longhouses. The 1600's saw the French establish New France and the English settled in the present-day US states of Maine, Vermont, New Hampshire and Massachusetts encroaching on Pennacook lands. The Europeans brought terrible diseases such as typhus, smallpox, measles, influenza and diphtheria and a series of epidemics killed nearly 75% of the Pennacook people. The French and Indian Wars (1688-1763) raged for 75 years as France and England fought for the new lands in North America. The Pennacook become allies of the French. The French defeat in the wars and inter-tribal warfare resulted in the dispersal of the remaining Pennacook people who, by the end of Queen Anne's War (1702-1713), had been largely absorbed into the Abenaki who relocated to Canada. 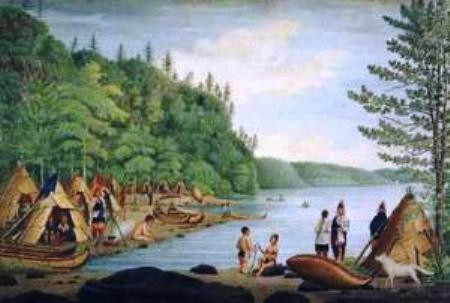 The descendants of the Pennacook tribe live amongst the Abenaki at St. Francis and Wollinak (Becancour) in Quebec. Other Pennacook descendents are based in Manchester, New Hampshire and in Franklin, Massachusetts. Where did the Pennacook tribe live? The Pennacook are people of the Northeast Woodland Native American cultural group. The geography of the region in which they lived dictated the lifestyle and culture of the Pennacook tribe who primarily inhabited the Merrimack River valley. What clothes did the Pennacook wear? The picture shows Chief Passaconaway and the clothes worn by Pennacook Native Indians. 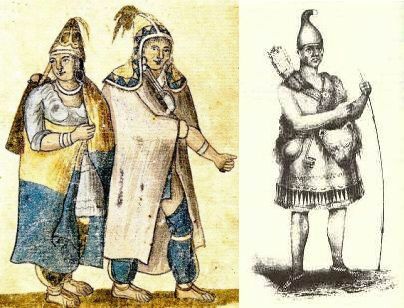 During the hot summer the Pennacook men wore a breechcloth tucked over a belt that hung to mid-thigh from the back with fringed leggings that tapered towards the ankle. Moccasins were made with a long tongue and a high collar that could be left up or folded down. Snowshoes were also worn during the winter. The Pennacook women wore deerskin wrap-around skirts, poncho style and also wore leggings. In the winter cloaks or mantles were worn by both men and women. The Pennacook also wore highly distinctive, pointed or peaked hoods made from birch bark or leather that covered the shoulder were elaborately decorated with feathers at the point. What did the Pennacook tribe live in? The Pennacook tribe lived in Wigwams, also known as Birchbark houses - see the above picture. These shelters were domed shaped or pyramid shaped wigwams. A Wigwam was built using wooden frames that were covered with woven mats, sheets of birchbark and animal skins. Ropes were wrapped around the wigwams to hold the birch bark covering in place. As time passed the Pennaccok started to build oval-shaped longhouses in fortified longhouse villages surrounded by fencing to afford defence from hostile tribes. What did the Pennacook tribe eat? The food that the Pennacook tribe ate included included their crops of corn, beans and squash. Fish such as sturgeon, pike, salmon and trout were caught. Hunters provided meat from deer (venison), bear, moose and smaller game like squirrels and rabbits. Duck, grouse and wild turkey also added to the variety of their food. Their food also included vegetables, mushrooms, nuts and fruits (cherries, blueberries, plums, strawberries and raspberries). Maple syrup was obtained from the sap of the maple tree. What weapons did the Pennacook use? Pennacook History: What happened to the Pennacook tribe? The following Pennacook history timeline details facts, dates and famous landmarks of the people. The Pennacook timeline explains what happened to the people of their tribe.